Gary Numan had a career arc similar to Devo's: after the first two albums, he lost his edge and started drifting towards the monotony of pop tunes. So these tracks are from those first two records and associated b-sides, except for a cut from a demo LP (called The Plan) and one later track from the Pleasure Principal album (which also contains that 'automobiles' song). 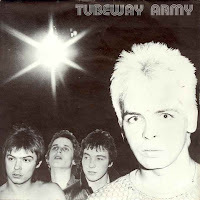 Numan, a teenager, wrote the music/lyrics and played all instruments but bass and drums. I haven't figured out how to arrange a playlist, so these songs are scrambled in random order. And check out this video clip from his multimillion tour a couple years later when he was famous. The whole paleo-futurism of it is so rad. It's 2008. Shouldn't we all be living this way by now, gliding through the neon fog in our robo-wheelchairs, accompanied by the musical hum of amplified oscillators? Stexe, the divshare player will play the tracks within a folder based upon the date and time in which they were uploaded. The oldest track will play first, the most recently uploaded track will play last, so you have to think about the play order before you begin to upload. A good way to do it is to create a playlist in iTunes or whatever and play around with the order until you get down the way you'd like, then upload the tracks to divshare in that order. Once you've uploaded all the tracks, embed the first track track of the set. Gotta love Numan's Davros cart. Yeah, that's exactly what I did, and yet some songs would go to the bottom of the list when I added them, and some would go to the top. I've had blogspot problems in the past, partially because I'm using a mac running safari, which is often the last in line for html updates. I'll figure it out eventually.